Reconstructing one of the best children’s board-games in the world. Caverns is a game from my childhood that you won’t quite find in the shops. Some years ago, I made a Caverns set for some friends. These notes describe the game and the project. What you hope to find in the caverns . . . In 1978 or thereabouts, I was introduced to a board-game called Caverns, made out of bits of cardboard (including, I distinctly remember, old corn-flakes boxes). Although I was told at the time that what I was seeing was a copy of a real, commercially-available game, it was over a quarter of a century later that I finally saw the original on which it had been based. By which time I had played it for years, grown up, and made several versions for friends’ children. 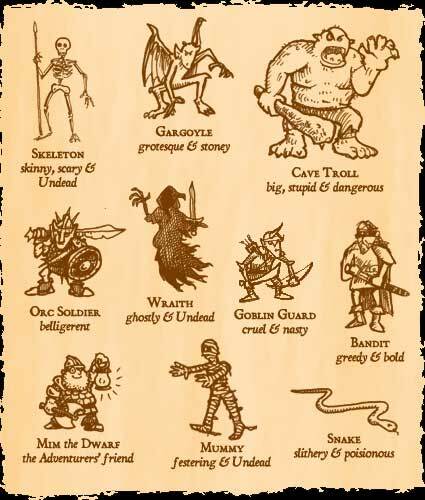 The game was unashamedly based in the Dungeons & Dragons world (D&D was still in its ascendency back then). Each player has a character, who has a Quest that is lost somewhere in the underground passages and caverns (containing treasure that is guarded, of course). The first player to find their quest and bring it out of the underground tunnels (by getting to a flight of stairs) is the winner. Simple. There’s an aspect to the game-design of Caverns that makes it, frankly, brilliant: unlike that awful, awful game called Monopoly, in Caverns there’s usually no protracted end-game during which you have to continue losing just for the benefit of the player who is going to win. That is, there’s rarely a time in Caverns when you are not involved in what is going on, even when you cannot win. To start with, everyone has the possibility of winning. You might have a weaker character than another player, but as you’re all independently looking for your quests this doesn’t intrinsically matter. You might have an easier Quest. Even if everyone else is doing very well, there’s still the spark of hope that you might find your Quest on the next move. That is, to start with, everyone dashes off and plays pretty much independently, with a roughly equal belief that they can win. As the game progresses, this changes. It might be that you suspect or discover that someone else has already found the Quest you are looking for. That introduces direct competition between the players’ characters that wasn’t there at the start. Or you might get killed — it’s a dangerous place underground, with poisonous snakes, ghastly Undead and even one terrible dragon. But the clever thing about Caverns is that when your character gets killed, although that means you can’t win, you join the growing number of players who can stop anybody else winning. So there comes a time in many Caverns games where one or two players are left trying to win with everyone else — cooperatively — trying to prevent it. It’s a clever mechanism, combining as it does solo play, tactical one-against-one play, and team play. All this on a board of tessellating tiles which means the caverns layout is different every time you play it. It also helps that it’s fast to set up and moves are generally over quite quickly. So although an unusually long game could run into the best part of an hour, you’re all taking turns fairly rapidly. Caverns works with any number of players up to about 10 (ultimately the limit is the number of character cards you have in your set). It’s even possible to play solo, for hours on end, until PlayStations or Xboxes are invented. But, generally, the more the merrier. Dice are used to determine the success of combat, escaping, making friends, and magic. Model figures mark the position of players and monsters. Spiders’ webs are marked with a web placed over the whole tile, for example. There’s some jiggery-pokery for determining if you meet or find something in a passage (rather than a cavern). Amongst other things, the rules include a list of the spells that magicians can use, describe what they do and the chance of them succeeding. 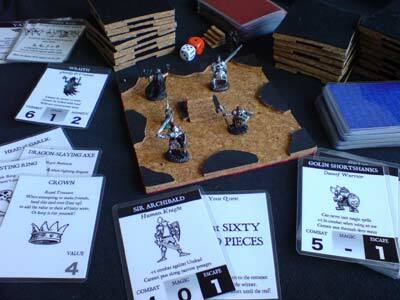 Right at the start of the game, each player is dealt a character card, and another card with their Quest on it. The character defines the abilities the player has within the game, and the Quest is the thing they must find in order to win. Everybody must keep their Quest secret (because you don’t want other players to realise if they have inadvertently found what you are looking for yourself). See the list of pieces for links to the actual figures. 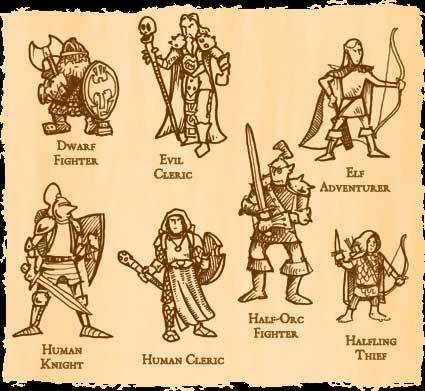 Players can be a variety of characters, all with relative strengths and weaknesses. Of course, as the game progresses, players may find treasure that bestows extra abilities. Characters that are good at sneaking but weak in combat are more likely to creep into caverns they find, whereas those with strength of arms usually choose to rush in. Some characters have special affinities with certain kinds of monsters. Some have limited magical ability (such as the useful Flying spell), others get extra bonuses with certain weapons. 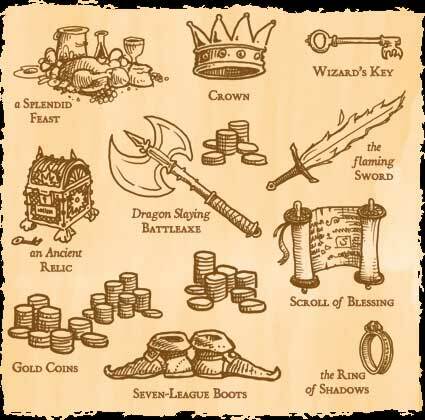 Quests can be more or less specific, such as “bring back an item of enchanted clothing,” or “find the Ring of Shadows.” Or they can be general, such as “either find a splendid feast, or at least 50 gold coins.” There’s one special Quest — the Dragon Slayer Quest (“kill the dragon and get out alive”). If you get the Dragon Slayer Quest and you’re too scared, you’re allowed to return it to the pack immediately and draw another one. Dragon Slaying is not for the faint-hearted! When you creep or rush into a cavern, you never know what you’ll find. If you’re lucky, it could be useful treasure (or even your Quest!). But often the treasure is guarded, and treasure is only any use to you if you can get it out without being killed . . . If treasure is valuable you may be able to use it to bribe otherwise hostile monsters. If it’s magical it might give you useful abilities . . . but often you can’t use a magic item without revealing what it is. And that could be risky if it’s another player’s Quest. They’ll stop exploring and come after you instead. There are a couple of special finds that you can’t carry out and (once you’ve discovered them) other people can use too. The All-Seeing Mirror is set in stone and lets you peek at other players’ cards. The Holy Place is useful to duck into if you’re being chased by Undead, but no other magic works for you while you’re in there. There are some nasty things waiting for you in the caverns. If you were confident and rushed in, you have to fight what you find. But if you crept in, you might be able to sneak out, or make friends, or use your magic. If you get killed, you can’t win . . . but you keep playing as the monsters, to stop anyone else winning. The Undead can be nasty because they can’t be bribed. And skeletons are thin enough to chase you through narrow passages and tall enough to pursue you through deep water. The most ferocious monster you can stumble upon is the dragon. Even other monsters are scared of the dragon! 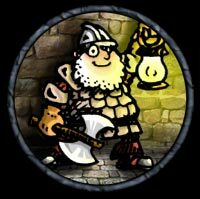 On the other hand, you might encounter Mim the Dwarf, the Adventurer’s Friend. He helps you find your Quest. A common strategy for players controlling monsters is to keep exploring, building up an “army” and stockpiling the treasure to stop it falling into the hands of the remaining players. Another is to nominate one or two “champion” monsters, and get all the other monsters to hunt out magic weapons, in order to arm these nominated individuals to the teeth. These then set out to chase down and destroy the remaining players. There have even been cases of “suicide deposits,” where valuable treasure is carried into the dragon’s cavern by an expendable goblin, thereby obliging any player who needs that treasure to battle the dragon first. As the board grows (players lay down tessellating tiles with connecting passages on them as they explore), the underground cavern system is revealed. Naturally, it’s different every time you play. There is strategy in the way you explore, because you can try to “head off” other players, or explore areas where others cannot easily follow. Although you may encounter some things in the passages themselves, generally it’s the monsters and treasure in the caverns that you are looking for. A cavern is marked with red dots: you declare if you are going to rush or creep in, and then you take one card for each dot to discover what you’ve found. If you’re lucky, it’s your Quest. You need to take it back to the entrance (or some other flight of stairs, because they all lead back to the surface of the world) to win. . . but be careful that you don’t let other players realise what you’re up to, otherwise they will try to stop you. Or it might be treasure that could be useful (an enchanted sword, a magic ring that lets you walk on water, some food you can use to bribe monsters). You can’t be sure, but it could also be someone else’s Quest, so just by keeping it secret you’re making it harder for them to win. If you’re unlucky it’s a monster who isn’t pleased to see you. Big, bulky creatures cannot pass through narrow passages. Short creatures cannot cross deep water. Sometimes passages or caverns will be infested with spiders (not little house spiders, of course, but scuttling carrion spiders the size of dinner plates). You can get held up in their sticky webs. Ugh! There is a flight of stairs leading down into the entrance cavern (that’s the place where your exploration began). But there are also other stairs in the passages waiting to be discovered. These all lead up to the surface of the world, so you can run up stairs, scurry across the surface, and run back down any other flight of stairs. Effectively you can jump from one set of stairs to any other, and it’s the fastest way to move around the board. So if you find a set of stairs, it means you can get back to the entrance quickly (which is handy because that’s what you’ll need to do when you’ve found your Quest, remember). But . . . it also works the other way round. If there are any monsters chasing you, they can use the stairs you’ve just found. It’s not uncommon for monster-players to loiter at one set of stairs, waiting for the players still searching for their Quests to “discover” another set. Then the monsters can use the stairs to mount an attack, without all that creeping around slowly in dark passages. The Beholder de-luxe Caverns set has laminated cards (very robust and child-proof) and felt-backed cork tiles (very sturdy). The tiles are about three inches square, which is probably as small as you can go and still have space for the figures (see below). But you still need a fairly decent-sized table to play on or, if the not-stepping-on-things discipline in your house is up to it, you could play on the floor. Little sets of stairs (also made of cork) are placed on the tiles with stair markers (because it’s useful to see where the stairs are when you survey the whole board). The water features (pools and flooded passages) are made with modeling “plastic” water. Although in principle you can play with counters, part of the charm of Caverns is using model figures to mark the position of the players and the monsters. Naturally, when I was playing this as a youngster, that led into an overlap with the figures we had for Dungeons & Dragons. Part of the power of childhood is that you can use anything to represent anything else, so I can fuzzily recall using a model of a giant toad to be the dragon, because I didn’t have a dragon model at the time. This form of pretense (some more generous people might call it compromise) has served me well later in life. These days, here in the UK, mainstream “wargaming” figures come from Games Workshop and are part of their own game system, which is primarily battlefield based. So it turned out that it’s not as easy as it used to be to get models of explorers kitted out with dungeon-exploring backpacks (let’s be specific here: that means a backpack, a coil of rope, and a lantern or at least a pitch-and-tar torch). But D&D still exists, and there’s a great little shop in London called Orc’s Nest where you can still peer through bubble-pack case after bubble-pack case to see little metal dungeoneers waving swords or wands or axes whilst encumbered with the right equipment. By being careful about cause-and-effect, I managed to get all the key figures (such as the players’ characters) before drawing the cards — so the drawings you see above (which appear on the cards, of course) are actually drawn from the figures. Figure-painting is a real skill (in fact, there are professionals out there these days) but it’s also part of the fun for the children. So when constructing this set I was conveniently excused the trouble since I left that for the players. My memory of the olden days is that a painted figure, no matter how badly painted it was — and remember we were young back then, so there wasn’t a great deal of shading or dry-brushing technique going on — would take precedence over an unpainted one, even if the character it depicted was not such a good match. It’s that childhood ability to accept and switch tokens so easily again. This makes me want to comment: although this project isn’t about making a statement about analogue versus digital games, one thing that a child playing a computer game never has to do is accept that this toad represents a dragon, when it plainly is no such thing. That is, there is a form of imperfection that in old-fashioned play was routinely replaced with imagination. That imperfection does not exist in video games, and therefore has been removed from some children’s play-worlds. I happen to suspect that that was a handy tool to learn to use when growing up. Specifically, I remember a fairly recent conversation I had with some Computer Science lecturers about how so many first-years these days simply don’t seem to be able to think symbolically. Maybe it’s not related. But maybe it is. The idea of trawling around underground passages battling monsters for treasure certainly wasn’t original — after all, it’s what Dungeons & Dragons was all about. But the combined features of tessellating tiles, exploration and reward, and questing, in a turn-based board game is not so common. In fact, there were two early games of this type. The first was The Sorcerer’s Cave and the second was Mystic Wood. As I mentioned at the start of this long page, I didn’t actually see either of these games properly until some twenty-five years later. One of my work colleagues saw some of the bits of pieces I was working on for Caverns and said, “Oh, years ago I got something a bit like that for my kids.” So I finally got my hands on a old set of Sorcerer’s Cave and saw in it the origins of the game I had played all those years before. It was fascinating to see because these two games have most of the key features of Caverns. In this way it’s clear that the first old, pokey Caverns set that I saw was a combination of ideas born and/or stolen from both of them. 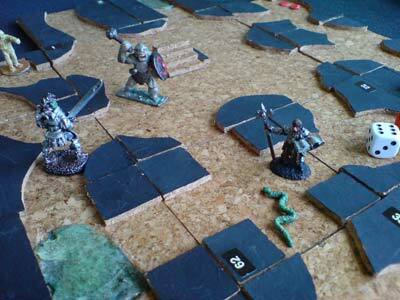 The Sorcerer’s Cave tiles look remarkably similar to the biro-and-cardboard ones I saw in Caverns. However, Sorcerer’s Cave is pretty much a solo game. It has the intriguing idea of the player’s party membership fluctuating as the game progresses, and a game can go on for a long time because it descends through levels (much like D&D) — Caverns did not inherit either of these devices. Mystic Wood has individuals competing against each other, and players win by finding their quest and escaping with it. This is clearly the inspiration for the Caverns win-criteria, except that in Caverns the Quest is kept secret from the other players (which has a significant impact on the way the game progresses). So I did a little research and quickly discovered that both these games were designed by the same guy — Peter Donnelly. He’s on the web here. In 1980 he wrote an interesting essay about the game’s design entitled The Sorcerer’s Cave and Its Sequel. The interesting difference in all of this is the key aspect that, to this day, has intrigued me about Caverns, and that is the way that once a player is killed they join the team of monsters stopping the remaining players. In Sorcerer’s Cave, death is the end of the game. In Mystic Wood I don’t think a player can be killed, only be out of the game for a few turns. Older nerds may be familiar with Rogue and, later, NetHack, which is close to the randomly-generated “dungeon” that these games’ tessellating tiles produce. The computer has the obvious advantage of being able to generate endless dungeons because there’s no physical limit to the monsters and caverns available. This game predated graphical displays so you can still play it in its symbolic glory. NetHack itself can get staggeringly involved. Incidentally, since Caverns tiles and cards are clearly generating surprisingly complex systems, it’s obvious to me that anyone who is fascinated by it as a child is predisposed to end up as a programmer when they are an adult. If you have read through all of this then you might be interested enough to get hold of a set. But also you will have realised that there never was a definitve game of Caverns. So take what you can from this and make your own version. That’s how it was passed on to us when I was little. We played and remembered (possibly getting the details wrong or deliberately improving on them), and then we made our own Caverns sets, customised to match the figures we owned and the characters and monsters we imagined would be down there. We made our own sets, so the game was different depending on who was hosting the game. Of course it doesn’t have to themed to the D&D-like world of fantasy. The setting isn’t the point — it’s the almost unique game mechanism of grouping players who can’t win against the remaining players who can. Second-hand copies of Mystic Wood and Sorcerer’s Cave do turn up on eBay, or Boardgame Geek. And finally, what I’ve described here is a game that grew, like Chinese whispers, from those two original games — so even if you dissect with those and work with what’s written here, you won’t be getting what I came to know as Caverns. That’s as it should be. Have fun inventing your own. There are a few Caverns-based illustrations in the Beholder scrapbook. So, somewhat contrary to the spirit in which that last section was written, I have now put the components of a complete Caverns set up on this site. This is because, over the years since I put the Caverns page on the web, enough people have asked for the details that I realised it would be easier to just sort these pages out than it was to repeatedly send polite emails explaining why I had not got around to doing so. So here they are — but don’t think this is the definitive game of Caverns: there is no such thing. This is just one set, and, if you make one too, yours should be a new version, different in any and all respects that suit you better. Have fun.